Meganisi island is situated off the East coast of Lefkada island, between Nidri and the mainland. It only six kilometres from Nidri by ferry. The ferry operates every day, but there are more services in the summer. From Nidri the ferry usually goes first to Spilia Bay, below the village of Spartohori – this takes about 20 minutes. It then continues along the North coast of Meganissi Island to the village of Vathi (about 10 minutes) before returning to Nidri. Meganisi island,with a population of less than 2000 people, offers complete relaxation in a typical Greek atmosphere. Here, there is no need to fill your days with activities. Laze by a beautiful pool with lovely views over the surrounding countryside; take a slow stroll down to the beach, or sip an Ouzo with the locals in the village taverna. There is a good choice of hotels, apartments and villas available, generally close to the sea or in one of the three villages. You can read a little more about these three villages below. The three villages of Spartohori, Vathi and Katomeri are all quite different and it is worth taking the time to explore all of them. Spilia Bay, on the North West coast of Meganisi, is a shelyered bay surrounded by steep hillsides covered in pine and olive trees. Spilia also has a small ferry port and a harbour which is popular with yachts and passing flotillas, and a couple of efficient tavernas. 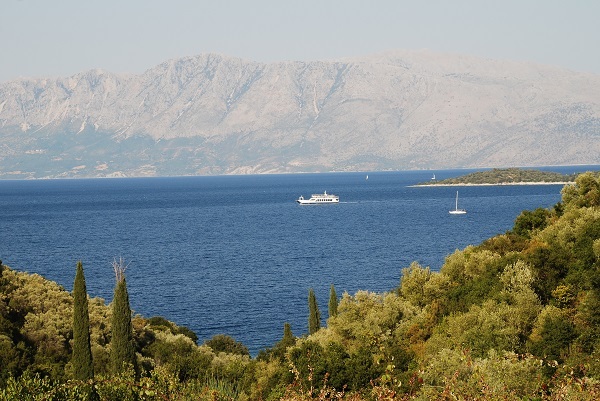 The ferry from Nidri often calls at Spilia first for 5 minutes before continuing to Vathi. But don’t rely on this; sometimes they reverse the route causing a bit of confusion – all part of the fun of travelling in Greece! At the end of Spilia Bay is a nice beach with crystal clear water, perfect for swimming, and a waterfront taverna which serves delicious lunchtime meals. Spartohori village, perched high above Spilia Bay, has a couple of minimarkets, some small tourist shops and a few tavernas. Reached by a 10 minute walk up the road or steps from the ferry port, it has spectacular views across the sea to the mountains of the mainland.